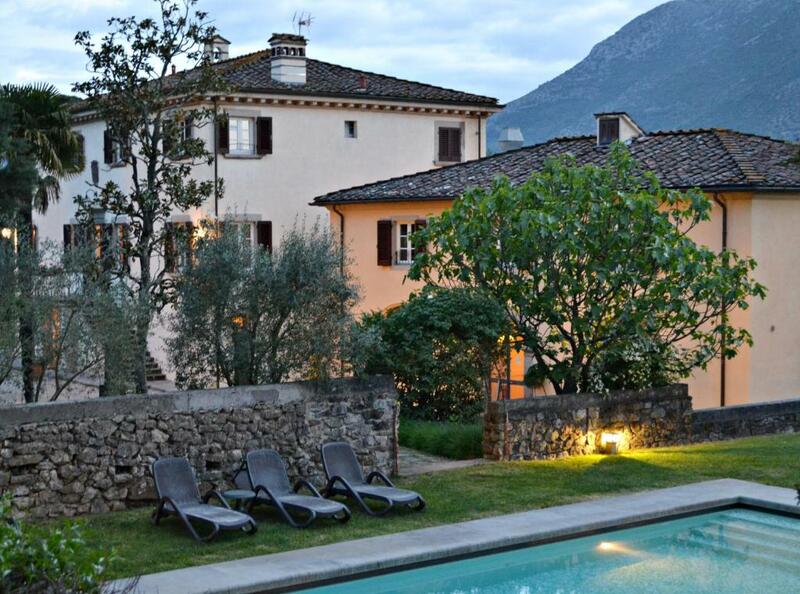 Lock in a great price for Hotel Albergo Villa Marta – rated 9.1 by recent guests! The room was sweet and very clean. The dinner was super delicious. Outstanding! And the next morning they provided us with bikes to ride into Lucca which was wonderful. All in all it was surprisingly enjoyable place to stay in Lucca. Highly recommend. For sure. Lovely small hotel 10 minutes drive outside Lucca. Did is hospitality personified. Jumping in everywhere possible to be helpful. Taxiing us when the injured foot couldn't do it any more. A excellent breakfast, great restaurant...cosy and great menu choices ....food presentation and service was excellent. The pool and outside seating was lovely. Everything overall... but especially the courtesy of the Staff and Francesco. The location and scenery were wonderful. Do not recommend arriving at night as fairly difficult to find the first time. After it was great once you get your bearings. This B&B sits on beautiful grounds, tucked away with an inviting entry and lovely surroundings. Spacious room, almost "regal". 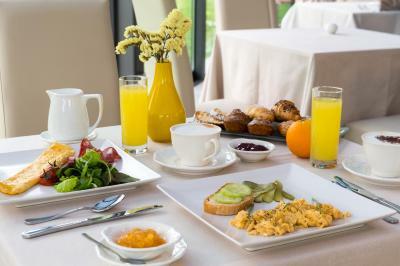 Loved the breakfast served - many choices of fruit, pastries, yoghurt, eggs, cheese, etc. Generous onsite parking. When we were there, the restaurant was open (convenient) and delicious. Close to other restaurants. Well situated, quiet, lovely grounds and dining . Hotel Albergo Villa Marta This rating is a reflection of how the property compares to the industry standard when it comes to price, facilities and services available. It's based on a self-evaluation by the property. Use this rating to help choose your stay! One of our best sellers in Lucca! Set at the foot of the Monti Pisani hills, this 19th-century hunting lodge offers a summer outdoor pool and a Renaissance garden. The historic center of Lucca is 3.1 mi away. Rooms at Villa Marta boast traditional Tuscan furnishings and a fully equipped private bathroom. Each room includes a satellite TV, and some also have lovely countryside views. From May until October, guests can find a restaurant and lounge bar on site. 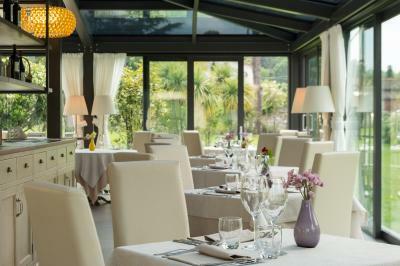 The restaurant serves specialties from Tuscany, such as homemade Tortelli pasta, while the bar offers salads and snacks. 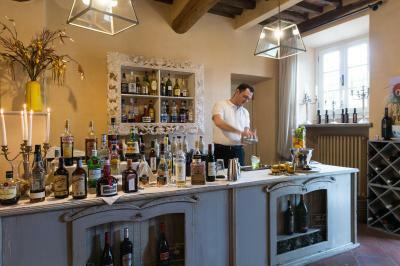 Hotel Albergo Villa Marta is a 15-minute drive from Pisa. Thermal baths at Montecatini Terme are 19 mi away. When would you like to stay at Hotel Albergo Villa Marta? Elegant room with a private bathroom decorated in a typical Tuscan style. It has a satellite TV, air conditioning and a minibar. The bathroom is complete with free toiletries and a hairdryer. This room is on the ground floor of the annex. 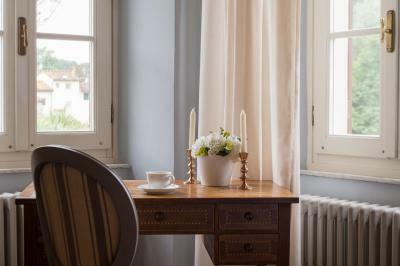 Set on the 1st or 2nd floor of the villa, this room has full views of the countryside. It offers a flat-screen satellite TV and a bathroom with 2 sinks and a large shower. Slippers and bathrobes are also provided. It comes furnished with fresco ceilings, or a four-post bed and exposed wood beam ceilings. Cannot fit any extra beds or cribs. Rate includes a late check-out until 12 pm, a welcome drink and free Wi-Fi, one bottle of water, pool towels. A packed breakfast of croissants and hot drinks is available for early departures, and a porter service for luggage is also included. Decorated in a classic Tuscan style, this room faces the garden or the Pisa hills. It comes with Tuscan terracotta floors and exposed wood-beamed ceilings. It features air conditioning and a TV. The rate includes a late check-out until 11 am, and a take-out breakfast of hot drinks and croissants is available for early departures. Some rooms can fit an extra bed or crib upon request. House Rules Hotel Albergo Villa Marta takes special requests – add in the next step! Hotel Albergo Villa Marta accepts these cards and reserves the right to temporarily hold an amount prior to arrival. In case of early departure, the total amount of the reservation will be charged. The restaurant and lounge bar are only open from May until October. The restaurant is only open for dinner, every day except Sunday. The lounge bar is open everyday for lunch. Beautiful place with a lovely staff. The best toilettes I ever found around my travels. Even the breakfast was great. I strongly recommend this place. The breakfast is very poor for the room rates they charge. Not the best location either. Okay for one night. Bathroom might be a little more comfortable. Very nice staff. Felt very much welcome. Dinner and breakfast were very good. General atmosphere is neat and the environment is calm with nice view. We wanted more time there! Great breakfast, peaceful location. Nice bike ride into Lucca. Breakfast was served in a delightful conservatory. Nice selection and Gluten Free products for my coeliac husband. Garden, service, dinner. Olive trees, so beautiful garden, natural light, flowers and lemons. 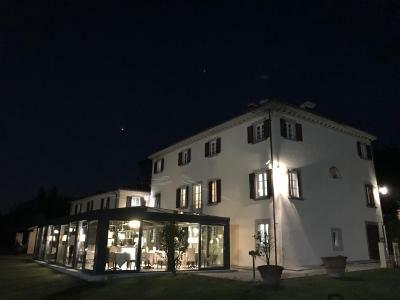 No bath or tea-making facilities in room - but we weren't expecting them..
Lovely staff, fantastic dinner and wine, comfortable bed and room, beautiful location very close to Lucca and Pisa. It would be good if there was a little gym. Also, the room was a little cold at the start and the restaurant was too. There were no eggs provided at breakfast and 8am is a little too late for it to open. The bed was comfortable. And the location is beautiful with its view of the mountains. The cleanliness was especially fantastic! The food at the restaurant was delicious! Rooms a little tired with some fittings needing repair. Furniture shabby rather than old and attractive. 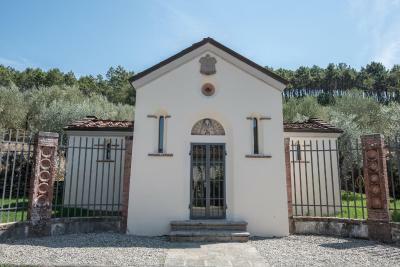 Good location close to Lucca. Quiet with nice grounds to sit including good pool area. Friendly and efficient staff. The day before they had a wedding, one could still see some left overs as confetti and some glasses in the pool area. It must have been late. The management was great, very helffull and kind. The hotel, garden and swimming pool area was great. 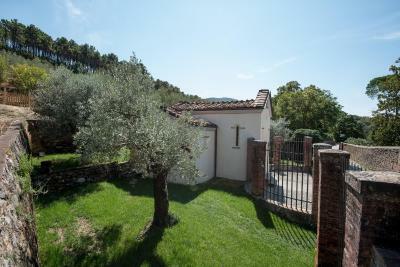 Just 5 km from center Lucca, therefor easy travelling to Lucca and enjoying a quiet and relaxed accomodation. Breakfast is good, not overwelming. We had diner in the restauranmt which was really good and fairly priced. Everything was very good but there were no drawers to put flat clothes but plenty of hanging space. Charming, friendly staff, a lovely conservatory restaurant, very good food and a pretty garden with a decent swimming pool and plenty of parking. A couple of chairs more at the swimming pool would be good. Staff was extremely friendly ans helpfull! The Room was spacious and clean with splendid views. The Restaurant deserves a star Michelin.